The dispute settlement between Indonesia and Malaysia in the Malacca Strait started with the unilateral claims of both countries. The prevailing unilateral claims resulted in the area of Exclusive Economic Zone in the Malacca Strait overlap. The United Nations Convention on the Law of the Sea (UNCLOS) 1982 is the existing International Law of the Sea and both countries, Indonesia and Malaysia, ratified to this Convention. 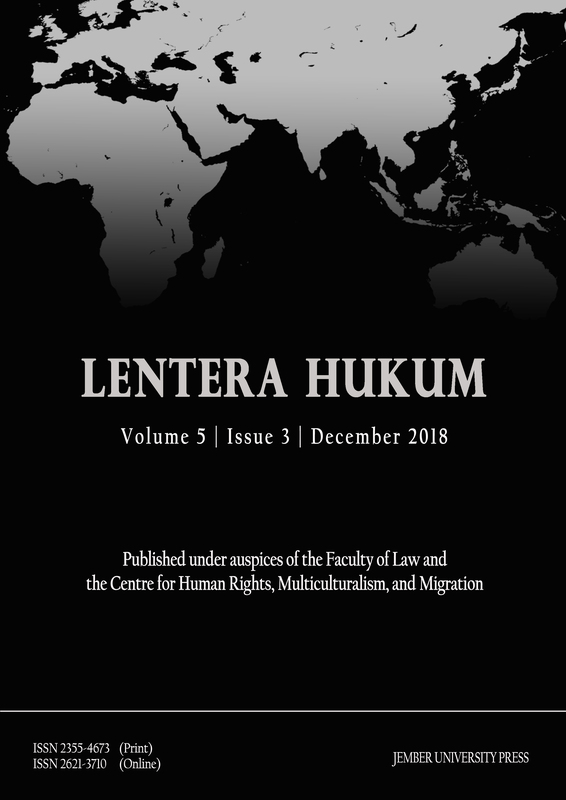 The purpose of this article is to find out how to resolve the sea border disputes between Indonesia and Malaysia in the Malacca Strait under the International Law of the Sea. In the end, this article is also aimed to provide a narrative to the factors underlying the existing maritime border dispute. YUSEINI, Maulidya et al. Penyelesaian Sengketa Laut Antara Indonesia dan Malaysia di Wilayah Selat Malaka Menurut Hukum Laut Internasional. Lentera Hukum, [S.l. ], v. 5, n. 3, p. 457-464, dec. 2018. ISSN 2621-3710. Available at: <https://jurnal.unej.ac.id/index.php/eJLH/article/view/7731>. Date accessed: 23 apr. 2019. doi: https://doi.org/10.19184/ejlh.v5i3.7731.